Carbon-fibre has only recently been seen as a viable material for large, mass production ’cross bikes. Previously, there just wasn’t the demand. However, with consumers wanting something that was versatile, fast, tough and ‘go-anywhere’, it was only a matter of time. There’s more to a carbon frame than it just being made from a light, exotic material. If it’s laid up correctly in the mould, it can offer a riding experience that puts its metal cousins to shame. 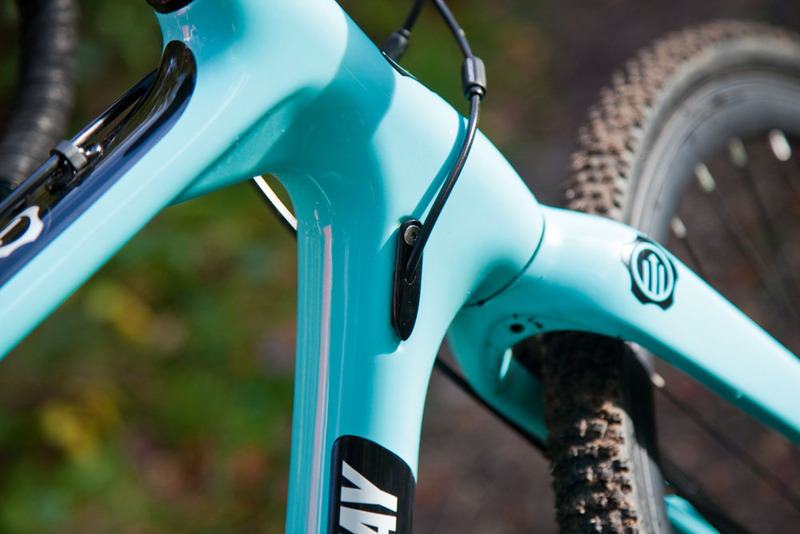 What manufacturers try to achieve in a frame are two essentials: firstly, the ride characteristics have to be good. That means the frame has to be comfortable to ride, while at the same time being stiff enough in the right areas so as not to waste any of your precious pedal power. The challenge of being the chassis of an all-terrain bike is even greater for a rigid frame; riding off-road can be a jarring and tiring experience. By knowing where to apply the right amount of carbon-fibre, understanding how that will affect the stiffness or compliance is the tricky part. The guys at Eastway have this aspect cracked, and they should be proud of the fact that this frame is spot-on. On many other rigid bikes, riding fast across a hard grass field is usually enough to have you fighting the rolling resistance of the turf while simultaneously bouncing you around all over the place, making it hard to keep the back wheel on the ground. The CX1.0 took it all in its stride. The other important factor is the handling, which, being an off-road-capable bike, is especially important. Fast riding benefits from a bike’s liveliness. However, the need for speed has to be matched by sound balance, allowing the rider to adjust their position on feel to find traction. I wasn’t disappointed; regardless of speed or terrain, the CX1.0 never failed to inspire confidence. 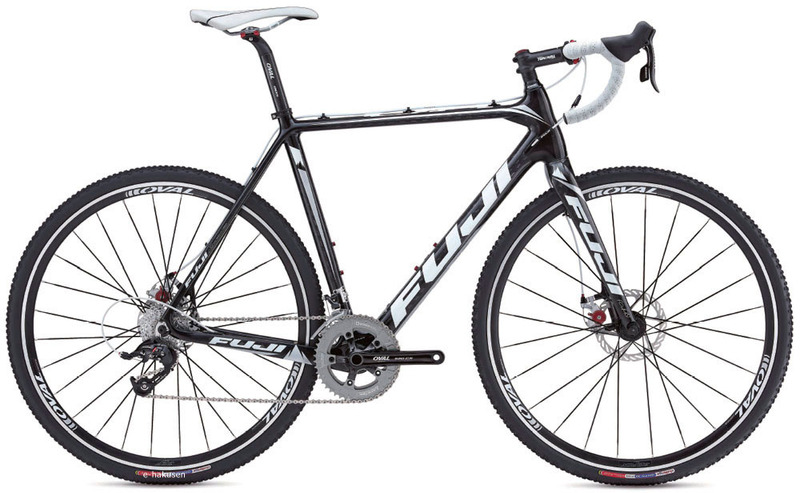 The groupset is SRAM Rival throughout, and that’s what you expect to see on a carbon cyclo-cross bike of this price. The gear-changing has a lovely precise click action and functions really well, although the SRAM Double-Tap system can take a bit of getting used to, and isn’t everyone’s cup of tea. It has to be noted that, as this is primarily an off-road bike, it has a slightly lower top gear than more road-orientated bikes. In reality, you only really notice this when going downhill or when you’re really winding the bike up to top speed on the road. The saddle, seatpost, bars and stem are all Eastway-branded and do the job, although it would’ve been really nice to see a bit of branded kit used, even if it’s just for the kudos. 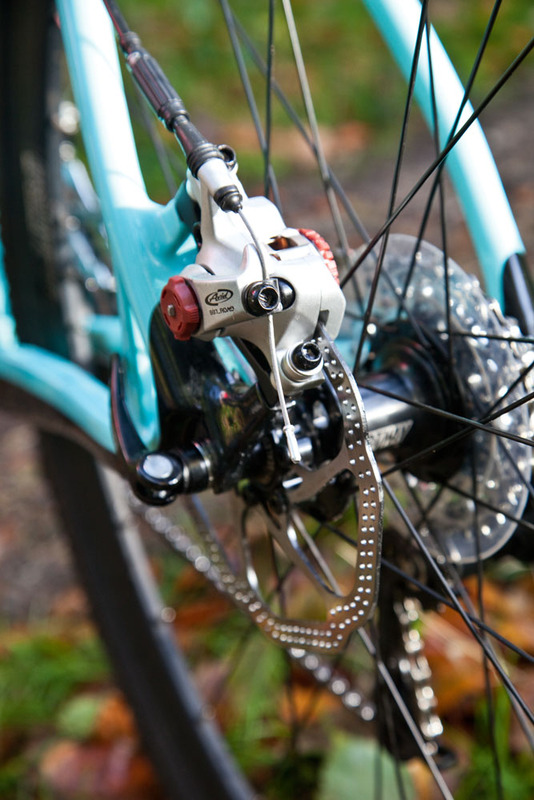 Disc brakes have become a familiar sight on this type of bike, and that’s grown out of necessity; discs replace the simple, but often ineffectual cantilever design. Using a disc at the centre of the wheel has many advantages, but the main one is great stopping power, especially in harsh conditions. Honed to thrive in cold, wet and muddy conditions, this bike has consistently strong braking. Although cable-operated disc brakes can be a little ‘grabby’, the Eastway’s Avid BB7 is a simple system that’s low-maintenance. A common complaint on disc-braked bikes is pad-rub, which can be annoying, but with the BB7 dual-pad adjustment, this is easily eliminated. iceable, but on short, steep, full-on lumps, their strength allows you to get full power down. Speccing a cross bike’s tyres is an almost impossible task, as no single tyre will cope ideally in all conditions. However, the Kenda Slant Six is a good compromise. 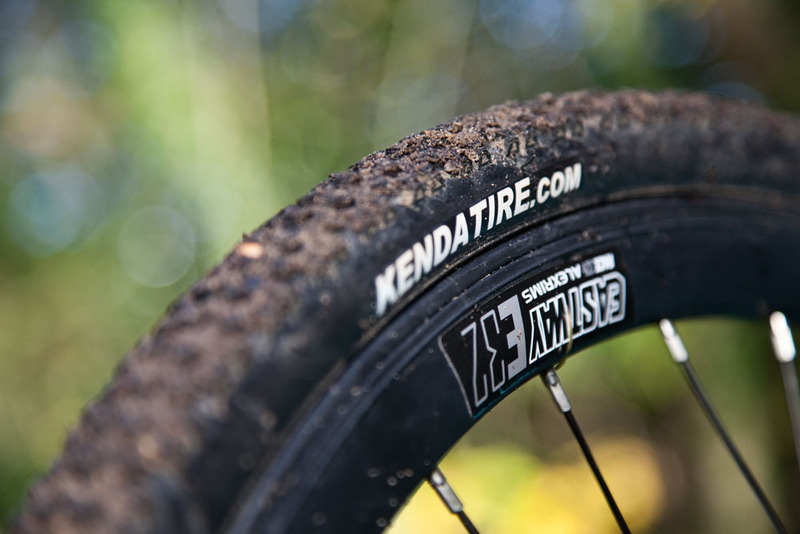 While it’s fast on hard surfaces and great in the dry, with the right pressure it also offers a decent level of grip in wet mud, though the tread is prone to getting bunged-up. If the bike is mainly to be used on concrete or hard-pack surfaces, a fat road tyre would be preferable and would enable the bike to hold its own with most road bikes at a similar price. Two thousand pounds is a lot of money to spend on a bike, but what you get for all that money is a pure racing machine through and through. However, this shouldn’t put off any interested non-racers, as the hugely versatile CX1.0 has a lot to give. If you can live with the racy riding position, there’s a lot of fun to be had. A carbon-fibre-framed bike with a world-class pedigree and similar spec to the Eastway that’s £150 cheaper, although the disc brakes are the slightly inferior Avid BB5.